Nancy Dziedzic’s face lights up as she talks about the vast African wilderness. The exotic animals. The beauty of the terrain. The all-consuming freedom of the outdoors. Dreaming about an African safari since she was a child, Nancy finally gets to embark on the adventure, determined to not let anything stand in the way — not even blood cancer. 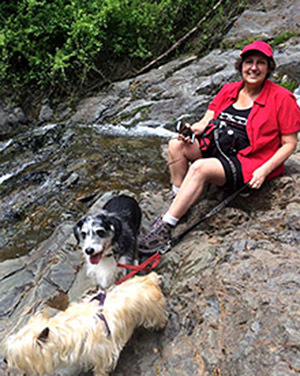 Diagnosed with multiple myeloma in September 2014, Nancy has endured many challenges of cancer— an arduous stem cell transplant, long hospital stays and coming to terms with the possibility of living with the disease the rest of her life. And she’s planned a lot of them. On Feb. 17, 2017, Nancy will set out on an eight-day journey to the top of Mount Kilimanjaro, the highest free-standing mountain in the world. Joining Moving Mountains for Myeloma, a sponsored team that is raising funds for myeloma research, is the opportunity Nancy said she wanted. “I finally get to go to Africa while also raising money for an important cause,” she said. The 15-member group includes researchers, caregivers and other myeloma patients who are approved by their physicians to participate. “We all have a common goal of climbing the mountain to create awareness for the disease,” she said. Nancy also hopes her desire to achieve this feat inspires others to help her reach a $10,000 fundraising goal. To prepare for the 19,000-foot climb, Nancy has intensified her training regimen, increasing time spent at the gym, adding weekend hiking trips and planning high-altitude practice climbs. In addition to helping prepare her for the Kilimanjaro trip, staying active during and after cancer has made a big difference in Nancy’s experience with the disease. Regular evening walks with her dogs helped her cope with the diagnosis and find healing, for example. She hopes her Kilimanjaro journey will inspire other myeloma patients to stay active and strive to live life to the fullest.